At the beginning of the 1980s, in Mulhouse (Haut-Rhin), Claude Braun took up the task of creating entirely handprinted papers for use in contemporary bookbinding. She quickly became renowned as an important figure in the work of artisan bookbinding. «Papers by Claude Braun» are today still part of the “haute couture” of paper marbling. After more than 30 years of endeavour, she has now passed the baton to her son Thomas. Folio and Co EURL was created in June 2015. 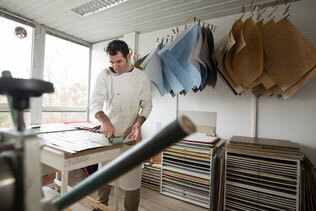 Its main activity is the creation of paper for contemporary artisanal bookbinding. Thomas Braun, its manager, took over the workshop handed over to him by his mother. This followed a long period in which they worked together, giving him the opportunity to work his way into the business and learn her secrets. Now located in Strasbourg, his workshop is carrying on this artistic craft. Formerly located within the M33, Collective, the workshop is currently located in Strasbourg, in an artisanal area which houses various artisans and artists with an interest in books (bookbinders, restorers, illustrators, engravers, painters, etc.). 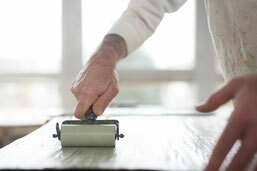 Printing plates which are in the same format as the sheets of paper (raisin format) are engraved in relief, then inked and pressed between the rollers of the intaglio press. One print cycle corresponds to one pattern and one colour. The vast majority of sheets undergo 3 or 4 print cycles, sometimes more. This is the price to be paid for depth and lustre! The inking is undoubtedly the most complex process. It is performed with a silicone roller and must be as regular as possible. No less than 50 turns of the roller are required each time, which amounts to thirty metres of travel! It is only when the sheet is taken out of the press that the result can be seen. And the surprise is either pleasant …or not so pleasant, with areas which are poorly inked, or not inked at all. If this misfortune occurs during the 3rd print cycle, for example, you need to start again right from the start! To change pattern and colour, careful cleaning must be performed, both by dry cleaning and then with a thinner. What is more, the inks take several days to dry for each print cycle, so it clear to see that we are talking about production involving true craftsmanship! This also explains why each creation is unique. If several «identical» papers are required, a large number of sheets must be put into production. This is the only way to ensure that the bookbinder ultimately obtains the number of sheets necessary to adorn a series of books or boxes.